Each Wednesday at Lookout Point, we serve chocolate throughout the day beginning with breakfast. Since we are life-long chocolate lovers, this very special day of the week is named Chocolate Covered Wednesday. 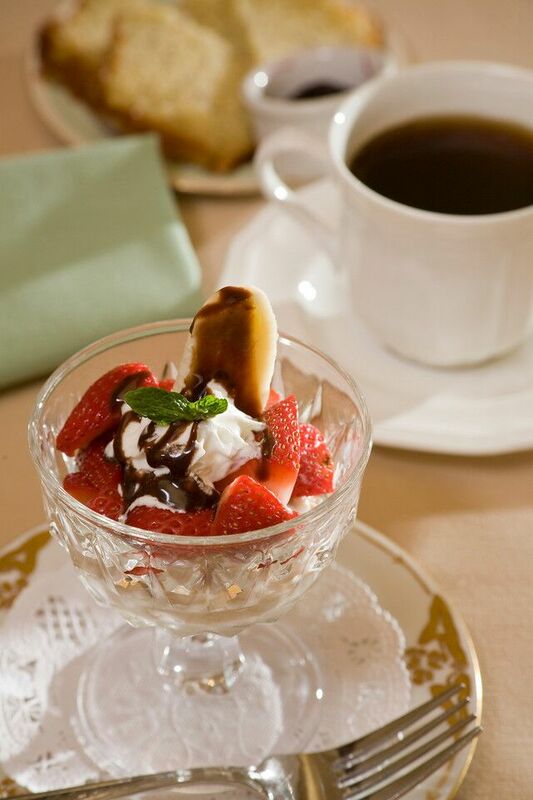 One of our favorite breakfast appetizers for Wednesday is this Berry Breakfast Sundae. Use whatever fresh or frozen berries you have on hand. Although we make homemade granola for the base, you could substitute a good quality granola to simplify the process. Regarding the berries, we often use fresh strawberries, and add frozen blueberries and frozen raspberries or blackberries. It all depends upon the season and what we are able to find. Wash berries and stem or slice as appropriate for the type of berries. Place in bowl and gently stir in sugar and lemon zest. In a separate bowl, mix granola and yogurt. Depending upon the type of yogurt and the thickness of the yogurt, you may need to add more yogurt. The goal is to make a thick consistency of the granola/yogurt combination to place in the bottom of a compote or parfait glass. Stir in the vanilla to mix. When ready to serve, spoon approximately 1/4 to 1/3 cup of granola mixture into bottom of compote dish. Top with the berries. Cut the banana into 3 parts, then slice down the middle to obtain 6 pieces. Stick one slice of banana into 3 parts, then slice down the middle to obtain 6 pieces. Stick one slice of banana into the sundae. Squirt a dollop of whipped cream beside the banana, then drizzle chocolate syrup on top. If desired, top with a mint leaf or lemon peel twist. This entry was posted in breakfast appetizer, Fruit, Lookout Point Lakeside Inn by admin. Bookmark the permalink.